Plot: Without giving anything away, the film is about a man who experiences a close encounter with aliens. He feels as if he's losing his mind, because he's obsessing about things he's "seen" and can't seem to get the images out of his head. Soon he discovers that he's not alone, and we may not be either. Why you should watch it: Science fiction films are a huge genre in cinema. While there are more well known series and films, Star Wars, Star Trek, Alien, etc, this film always seems to be lost in discussion. I believe the reason is because it's more of a thoughtful and cerebral film. It lacks the action which is prevalent in many sci-fi films, and therefore it's not as appealing to our need to be entertained. Because many people are conditioned to have instant gratification, films which require careful thought and attention don't necessarily get the credit they are due. First off, it's a Spielberg film. We all have our own ideas about what constitutes a Spielberg film. When you think of Spielberg, images of Jaws, Indiana Jones, ET, Schindler's List, Saving Private Ryan, and many more spring to mind. There is no debate that he is a phenomenal storyteller. His direction is deft, he creates incredible imagery, his dialogue is effective (meaning, he doesn't really waste language), and he reaches inside to touch the human element. 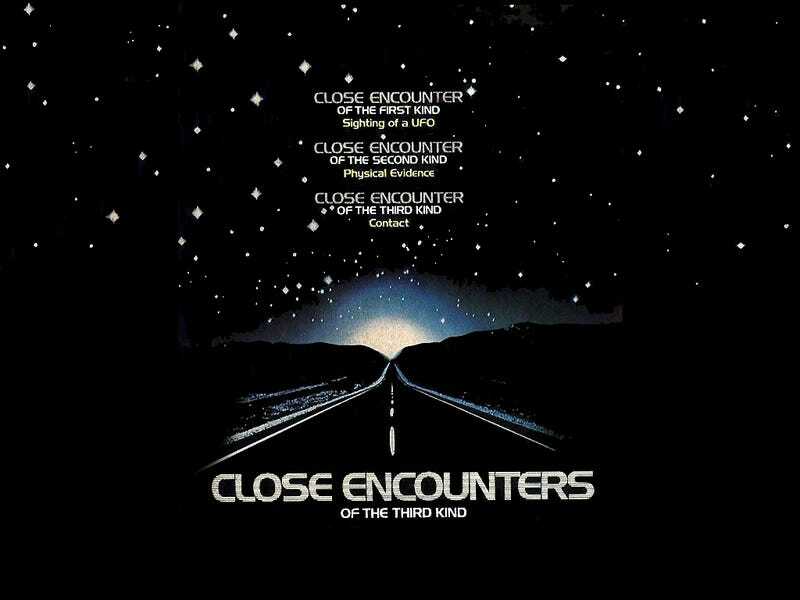 Close Encounters encompasses all of this and more. Unfortunately, some people are put off by the title. It's not a very punchy title. It requires the potential viewer to figure out what a third encounter is, and what constitutes encounters one and two. A third encounter is physical contact with an extra-terrestrial. Unless you have a cursory knowledge of UFOlogy (a real term, I assure you), you may be hesitant to watch this as opposed to something like Star Wars or Alien, two very specific titles which leave not much to decipher. I am a staunch believer in life elsewhere in the universe. To think that we alone are the only intelligent species or planet in the universe is ignorant at best, and arrogant at worst. Therefore this film resonates with me. The film deals with contact in a very realistic way, one that is quite plausible. First off, the acting is excellent. Dreyfuss plays the role of Roy with a wonderful sense of paranoia and excitement. Teri Garr portrays his suffering wife in a very realistic way, devoid of overacting and hysteria. Melinda Dillon and Cary Guffey play a mother and son quite convincingly, and they leave a harrowing feeling of potential loss and despair exceedingly well. Francois Truffaut, a French filmmaker of incredible merit, plays an investigator who is passionate and understanding, thirsting for both truth and knowledge. Second, Spielberg is his usual incredible self, handling both the directing and the scriptwriting with the brilliance for which he is known. This film, hot off the heels of Jaws, really cements him as a Hollywood power player very early in his career. The direction is effortless and the story moves along at a pace which is pleasing to the viewer. Spielberg knows how to handle actors and how to get the most out of them. People forget just how good of a storyteller he is as well. This film serves as a reminder. Finally, if you like films about UFOs, aliens, and the human condition, this is a great movie to see again. While it clocks in at a manageable 2 hours 20 minutes or so, it doesn't bog down or stumble under the weight of its subject matter. Like I said, this film seems to get lost in the shuffle, so take the time to view it again. You will be happy that you did. The trailer that I found is for the Special Edition DVD release, but it does the trick.